Home of the Rivercats AAA Baseball Team. The ballpark is located directly across the River from the Embassy Suites Hotel. Enjoy a short stroll across the Historic Tower Bridge and take in a game with friends and family. Old Sacramento is a part of the 28-acre National Historic Landmark District and State Historic Park, located along the Sacramento River in Northern California. The area has a Gold Rush era theme and is filled with spectacular shopping, dining, museums and historical attractions. Old Sacramento boasts many exciting events throughout the year, including kid-friendly events. For the finest Sacramento sightseeing available, take a short walk from the Embassy Suites Sacramento Hotel to the docks of Old Town and hop aboard one of Hornblower’s exciting river cruises. Guests see the region’s most scenic sites and enjoy five-star service aboard comfortable vessels. ArcoArena is one of the top venues for sports, entertainment and special events in Northern California. With nearly 200 spectator events each year, Arco Arena is one of the busiest buildings of its kind in the United States. The first public art museum founded in the West, the Crocker Art Museum was established in 1885 and remains the leading art institution for the California Capital Region and Central Valley. 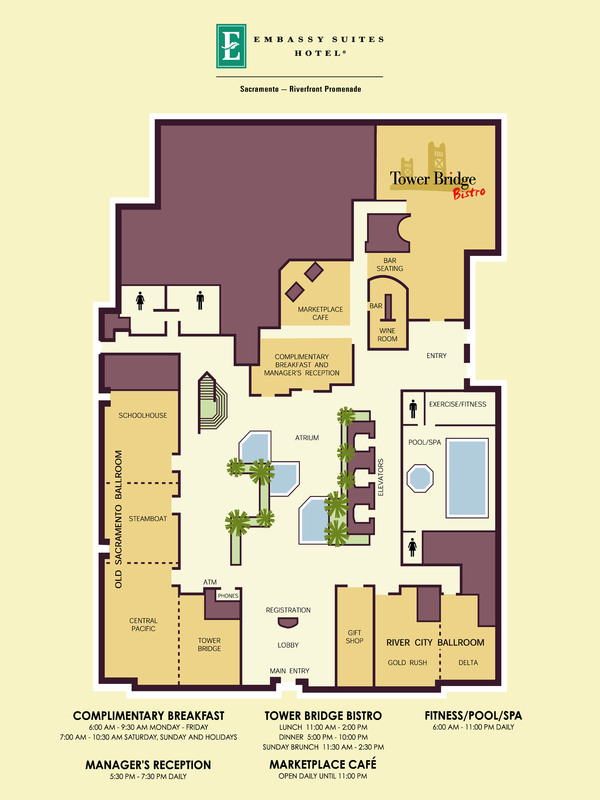 Stay in the ideal location for the best shopping in the Sacramento area! 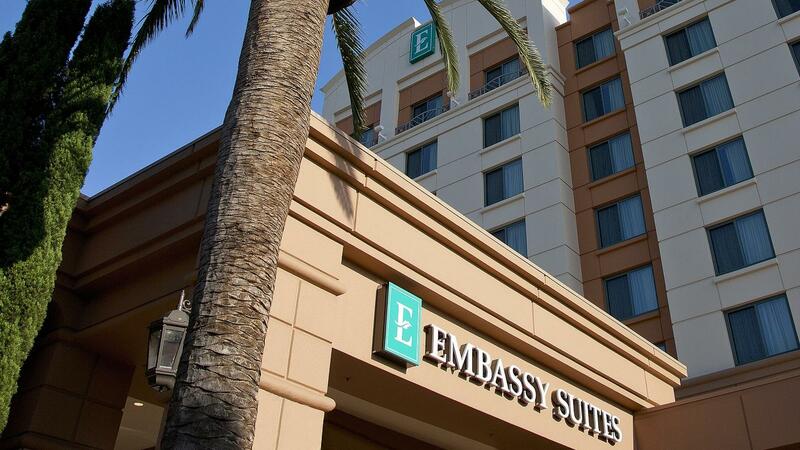 Embassy Suites Sacramento is just four blocks from the DOCO shopping Plaza and directly across from the shops in Old Town Sacramento. From department stores to small boutiques and souvenir shops – everything is within a short walk of the Hotel. Midtown is just minutes away and also has stores of all kinds for your shopping enjoyment. With so many options nearby, you are sure to find exactly what you are looking for. The Embassy Suites Sacramento - Riverfront Promenade hotel is located on the Sacramento River across from historic Old Town Sacramento. This full-service upscale all-suite hotel is just minutes from the California State Capitol, ARCO Arena, Sacramento International Airport and the Cal Expo - California Exposition and State Fair. Guests of the Embassy Suites Sacramento hotel stay in spacious two-room suites and will enjoy many hotel amenities, services, and facilities including: •	Complimentary Cooked-to-order Breakfast •	Complimentary Manager's Reception in our Atrium each evening •	Complimentary use of our In-hotel Fitness Center •	Complimentary USA Today (M-F) & Sacramento Bee Newspaper daily •	Indoor pool and Whirlpool hot tub •	On site Restaurant, Café and Gift shop •	Newly Renovated Guest Suites •	Two 42” Flat Panel televisions in each suite offering cable TV, HBO and Movies •	Suites include wet bar, refrigerator, microwave and coffee maker •	High Speed Wired & Wireless Internet Access •	Two line telephones with voicemail •	Separate living area with dining/work table & pull out sofa sleeper •	Serta Sweet Dreams Pillow-top Mattress & down comforter bedding package Meeting Space Information: • Over 8,000 square feet of flexible meeting/banquet space. • 2 Ballrooms, 2 Boardroom, Atrium Terrace and Riverfront Patio. • Largest meeting room is 3,728 square feet with banquet capacity for up to 280 people. 48 hour for individual guest room reservations. No Pets. No oversize vehicles or trailer parking (vans and SUV's OK). No Helium Balloons. Walking distance to the State Capitol, Raley Field, Golden1Center, DOCO shopping Plaza, Crocker Art Museum, Railroad Museum and many more attractions in and around Downtown and Old Town Sacramento.